If the word catechism sounds unfamiliar to you, don’t be too surprised. It’s not used as commonly today as it was in the past. However, it’s not a complicated word. The word catechism is really just another term for teaching. The Heidelberg Catechism is a teaching tool used instructing people in the basic truths of salvation in Jesus Christ. This Catechism is especially suited for oral instruction. It is set up in question and answer format. The answers in the Catechism are generally quite short and carefully structured. Some even have a poetic rhythm or ring to them. All of this helps to make the Catechism a memorable and useful tool for instructing people in bible doctrines. There are 129 Q&As in the Catechism, divided over 52 sections called Lord’s Days. The common abbreviation for a Lord’s Day is LD. In LD 8-22, the second part of the Catechism contains an extensive explanation of the Apostles’ Creed, one of the most widely used ecumenical creeds. The third part provides detailed instruction about the Ten Commandments (LD 34-44) and the Lord’s Prayer (LD 46-52). The Catechism is not at all replacement for Scripture. It is meant to lead you deeper into the Word of God, not draw you away from it. That’s why under each Lord’s Day you’ll see lists of Bible references that indicate which Bible passages the Catechism is summarizing in each answer. From the quick overview that the Catechism gives, you can go off and explore the treasure of Scripture’s teaching on many different topics- from faith (LD 7) to the resurrection from the dead (LD 22) and many others. The Heidelberg Catechism was first published in a German territory called the Palatinate on January 19, 1563. A governing official, Elector Frederick III, initiated the whole project and had it written by Zacharius Ursinus and Caspar Olevianus. Frederick III gratefully acknowledged that some of his predecessors had worked hard to advance people’s understanding of the Bible, as well as their application of it in their daily lives. Still, as the saying goes, there’s always room for improvement. However, the Bible is a large book, with many truths, some of which are revealed in historical writings, others in poetry and still others in visions. At times it’s challenging to fit all these details together in one coherent picture. And if someone doesn’t grasp the big picture, how he will comprehend the details, let alone apply them in his daily life? Precisely here is where the Catechism helps the church move forward. It provides an easy-to-understand guide to the “big picture” and also shows Christians how to begin applying Scripture to the nitty-gritty of daily living. Whether they lived back in the sixteenth century or whether they are sitting in your family room right now, children are still children, and teenagers are still teenagers. By nature they are not necessarily inclined to pick up God’s Word and read it from cover to cover. Yet at the same time, if they don’t learn the gospel of salvation well, the future of the Church begins to look pretty bleak, doesn’t it? The Catechism is especially geared toward youth. It speaks at a level they can understand. It asks questions for which they want answers. Using the Catechism with the youth of the church will bring forth a bountiful harvest of righteousness for generations to come. Most preachers are sincere, hard-working individuals who are worthy of our respect (1 Tim 5:17). They do their best to explain God’s Word to their congregations. However, truth be told, each pastor has his favourite doctrines that he loves to speak about. Even if it’s not intentional, he might skip over other doctrines. Beyond that, one pastor may explain the significance of Christ’s death in one way, while the pastor in the next congregation does it differently. Sometimes the two approaches are complimentary, but other times it’s confusing. Preachers don’t have to be carbon-copies of each other, but consistency among them would go a long way toward strengthening the church. The Catechism was written to encourage consistent and coherent preaching and teaching among pastors. Generally speaking, curiosity is a good thing. You learn by asking lots of questions. However, there’s another side to that coin. Sometimes Christians get tangled up debating questions for which there are no answers in the Bible. Or the matter under discussion is really quite trivial in the grand scheme of things. What was God doing before the world was created? Do angels have two or six wings? The Catechism teaches us to ask genuinely important questions. In fact, many of the questions asked in the Catechism have significance not only for this life, but for eternal life. Learning to ask really profitable questions is another strong reason for using the Catechism. Many heretics sound surprisingly orthodox. They refer to God the Father, Son, and Holy Spirit. They proclaim Christ’s death on the cross, and call people to put their trust in God’s eternal Son. Still, like the Bereans (Acts 17:11), we are called to compare everyone’s teaching with the inspired standard of God’s Holy Word. But who has the time to do that consistently? Who has enough knowledge of the Bible at his fingertips to discern truth from error, efficiently and accurately? Certainly, any help we can obtain for pinpointing heresy is most welcome. And that’s another thing the Catechism has to offer. It does not shy away from the task of pointing out errors, and pointing us away for them, for our own spiritual well-being. These are some of the main motives that Elector Frederick III had in his heart when he commissioned the publication of the Heidelberg Catechism. If you want to read the entire preface for yourself, it’s one of the resources on this website. Just click here. We hope you’ll see that Frederick III’s reasons for having a catechism are still relevant in the church today. If God’s people needed a faithful summary of Scripture back in the sixteenth century, we still need it in the twenty-first century- perhaps even more urgently. The Heidelberg Catechism is still actively used today for teaching and preaching . 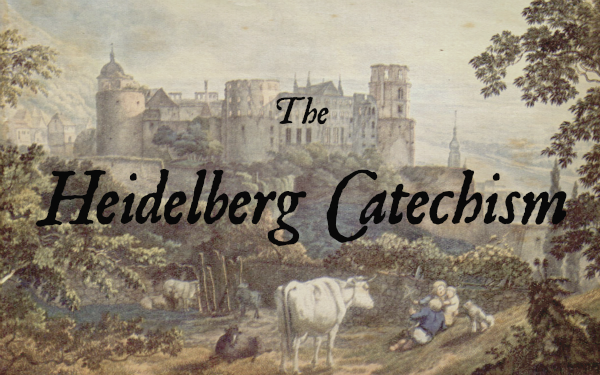 Find more about the Heidelberg Catechism here, along with countless text, audio and video resources!